Online proofreading for blog and social media posts has become popular as every industry adjusts to the digital era. 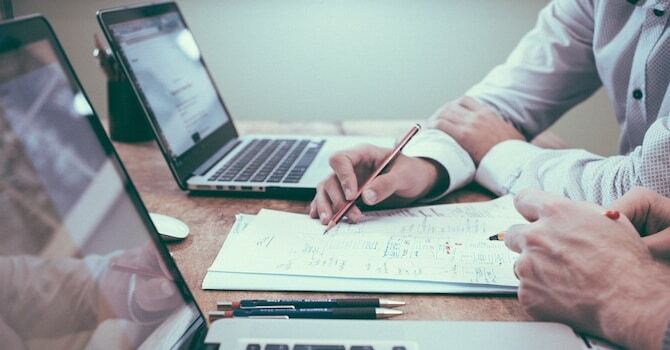 Content marketing has also become a powerful way for small and enterprise-size businesses alike to increase the amount of revenue they earn in a cost-effective manner. Even things like advertisements and storefronts are moving online exclusively for some businesses. We're going to explore online proofreading in this post, specifically what it is, why it's important and how you can use a few simple tools to implement it in your content marketing strategy. Online proofreading has a simple definition. 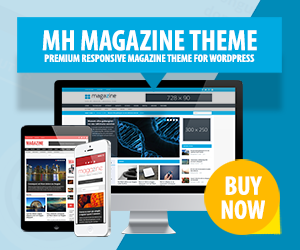 It's the act of checking style, grammar and spelling for errors through the use of web applications, extensions and even plugins, only it focuses on digital content. The two biggest categories for these tools are web applications and browser extensions. You copy your document or save it as a certain file type, visit the online proofreading tool's website, upload the document, and allow the tool to do its thing. Browser extensions are similar, except they allow you to check grammar on the fly. This is especially useful for those who work exclusively online as it'll help you proofread blog posts, social media posts and more without wasting too much time. Online proofreading is important for the reasons proofreading for print is important. It allows you to pinpoint and correct any and all errors you find on a page. The reason why you'd want to do that is just as simple. Typos and grammar mistakes give off the wrong impression. They make your writing appear sloppy and unprofessional, and they can even send the wrong message. Let me elaborate. Proofreading and grammar check helps you keep an aura of professionalism on your blog that encourages people to take you and your content, or what you have to say to be more specific, more seriously. Some people can't see past a typo or error in grammar, and they aren't shy about pointing it out, especially if they disagree with what you've written. Let's talk about the other statement I mentioned, the one about “sending the wrong message”. Have you ever received a text or an email from someone who doesn't use punctuation? It's like deciphering a scripture of hieroglyphics written by the ancient Egyptians. Your writing may not be that awful, but missing or misplaced punctuation, typos, misspelled words, and improper tone can throw off entire sentence structures, making it difficult for some readers to understand the meaning behind what you're saying. A simple error can completely change the point you're trying to get across. 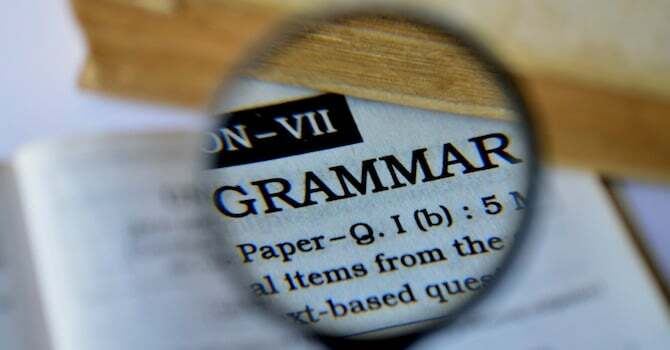 Proofreading and grammar check is quality control of your content. Okay, so we've established the importance of proofreading and editing the content you release online, no matter if it's a blog post or a simple tweet. Let's switch gears and talk about why using online proofreading tools may be more beneficial than hiring a professional in some cases. The use of the word “hire” is a major reason. A proofreader, whether they're freelance or full-time, is going to be an extra expense to your business. Is it worth it to have a professional proofread a blog post or piece of advertisement before it gets published? Can your business even afford it? My answer to the first question usually is no, at least if you're a semi-professional blogger or small business. 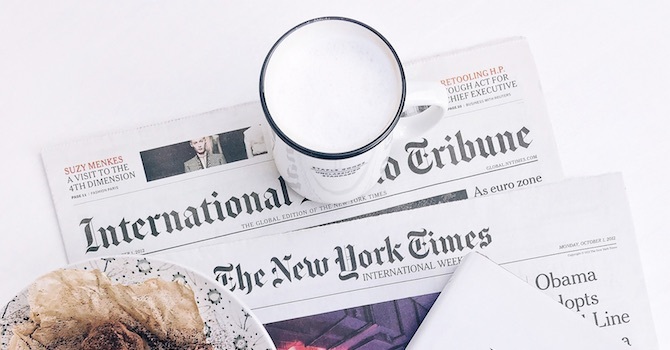 Professional proofreaders should only be used in the editorial or publishing industries where editorial means professional news, media and magazine sites and publishing means books. The readers of such bodies of work likely have much higher standards than the readers of your blog. EduBirdie has created a thrilling free grammar check for students. If you regularly write essays or create documents in your work, this spelling and grammar checker can really help. Whilst some checkers are complicated, this tool could not be easier to use. It has a simple copy and pastes process – all you have to do is paste your text into the box and then click the “check text” box. The checking tool then does all the hard work. To see your errors, click on the red marker in the right-hand corner. A pop-up box is then displayed. The tool then shows every error within the document. Errors that appear include grammatical flaws, spelling mistakes, incorrect word usage, tense shift faults and more. You can correct your text in a matter of seconds and rest assured that your work is 100% accurate. Hemingway Editor is a web app that's also available in premium desktop applications for Windows and Mac systems. It's one of the most, if not the most, thorough proofreader on this list. It color codes the various grammar issues in your document and highlights them using those colors to help you make changes in an easy fashion. My document was broken down into several different sections, as you can see. They are: adverbs, passive voice, complicated phrases and hard to read sentences. It also displays the number of words the document has as well as what the overall readability score is. If you click the “Show More” button underneath the word counter, you can see it shows things like reading time, the number of letters used, the number of characters used, etc. You'll also receive suggestions when you hover over certain things. After the Deadline is another free and simple tool that separates issues into three different categories. Spelling errors are underlined in red. Grammar suggestions are underlined in green, and style suggestions are underlined in blue. If you have the Grammarly extension active (we'll get to that in a bit) you'll also see suggestions from that as well. You can also use After the Deadline inside of WordPress if you have enable the proofreading services in the Jetpack plugin. Back to the current editor, various options pop-up when you click one of the suggestions. 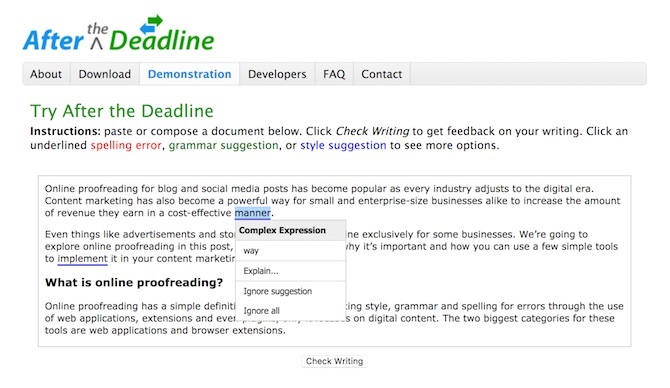 Slick Write is more of an advanced online proofreading tool. It uses an editor similar to the one the rest of the tools use, but it also includes different tabs for different statistics. These include stats for structural flow, sentence length flow and word flow as well as the number of function words used, number of adverbs used and more. The only drawback is the fact that the editor doesn't color code the issues it finds by type, so you'll need to go through each one to see what they are. 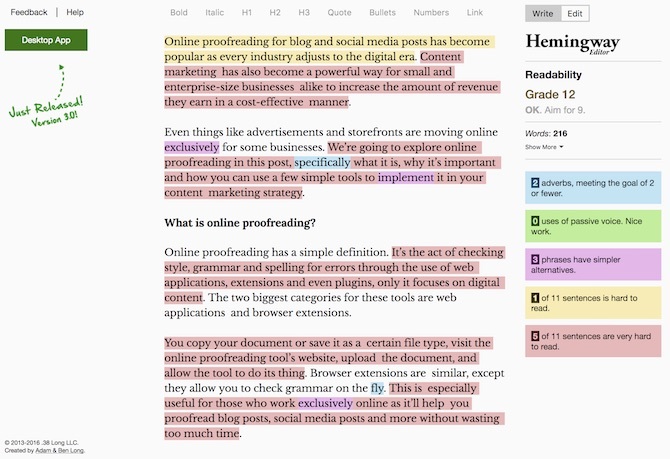 Grammarly has become one of the most popular online proofreading tools available. It has a web application, but you can also install its browser extension. Unfortunately, I found this application to be lacking in terms of what it's capable of detecting when compared to the tools listed above. If you look closely at the bottom of the screenshot above, you can see I'd need to pay for the premium version (~$30/month) to view the 10 more issues it found. 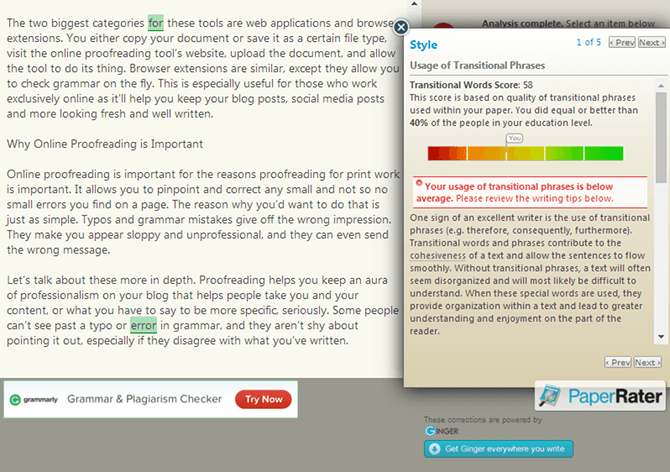 Grammarly does have one up on the rest of the tools, however. 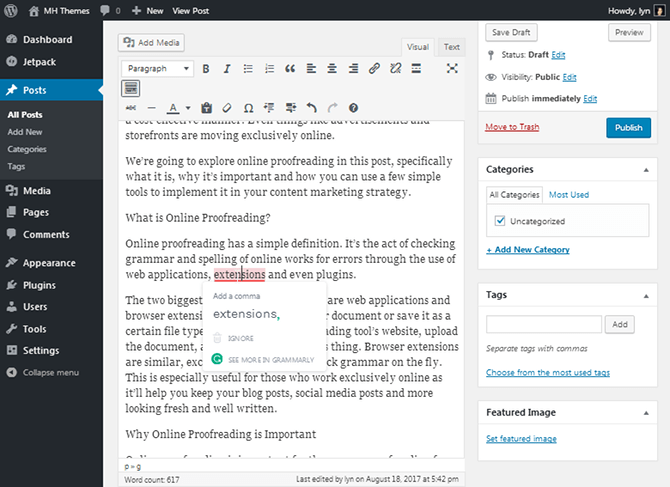 Its browser extension allows you to proofread inside of WordPress. 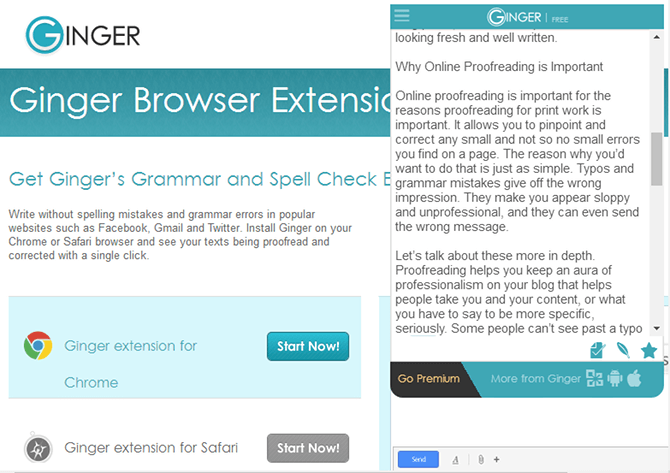 Ginger is an online proofreading tool available for a variety of different platforms, including as a browser extension for Chrome and Safari. It's a very simple tool, so simple, in fact, it only found three issues versus the dozens of issues the other tools found. The way the tool works is simple. You click the Ginger extension icon at the top of your browser, and paste your document into the text editor provided. You can also type by hand or check things on the fly. Paper Rater is the last tool I'll mention. It's a free tool, but it's a bit lackluster beyond pinpointing simple word usage errors or typos. It does give you scores based on style, grammar and more, but it doesn't actually list the errors that led to the score it gives you. All you get are explanations on how to improve your writing. 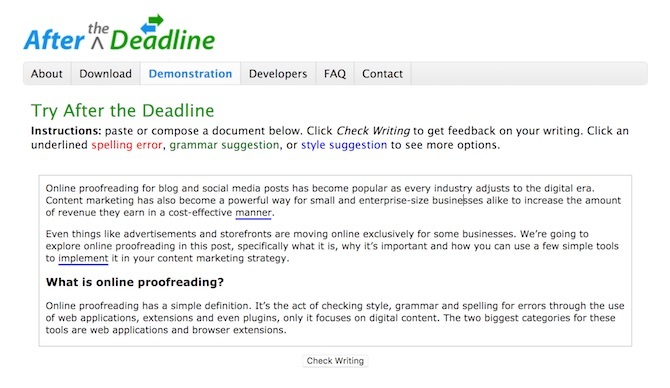 Online proofreading is a useful strategy to implement into your content marketing workflow. You can't always have another set of eyes to take a look at the draft of a blog post you wrote, but these tools provide free and simple ways for you to do so. 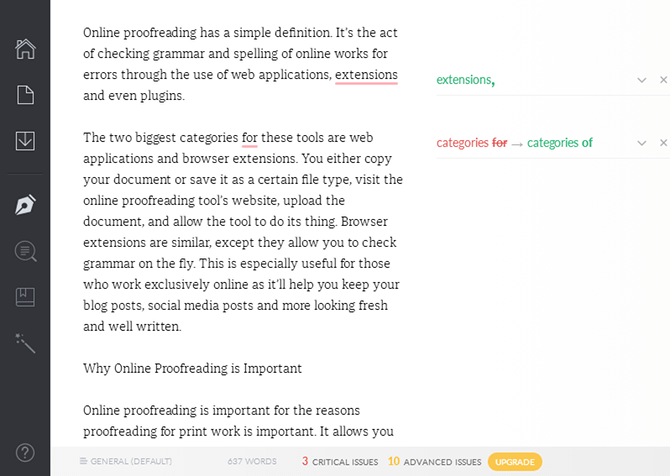 Incredible free online proofreading tools to correct errors in your content! 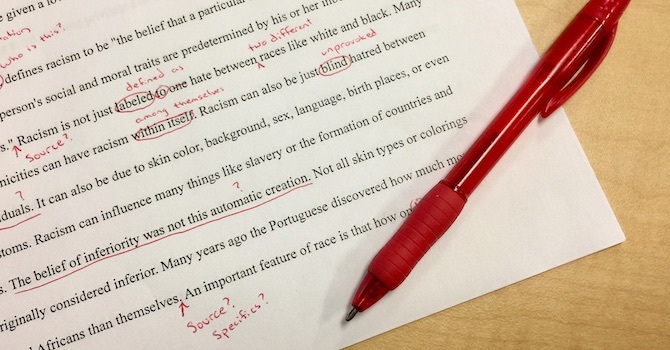 No doubt, all these tools proofread and edit the content in very less time. But, I think that the human brain is the best proofreader as compared to any software.